We recently had an opportunity to visit a farm and my one-and-a-half-year-old daughter just loved interacting with the farm animals. But you know what&apos;s even better than farm animals? I&apos;m so excited that Natural Valley Ranch is once again holding its Bountiful Babies at the Ranch event from 2-4 p.m. this Saturday, April 22. 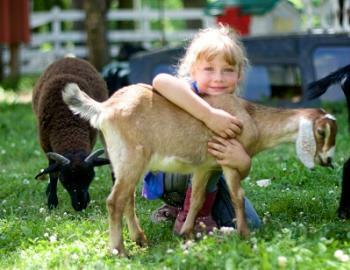 Animals will include baby chicks, baby ducks, miniature horses, goats, baby bunnies and kittens. Other activities at the event will include making a goat snack and feeding the goats, learning about the parts of a horse, crafts, face painting, pony rides and a photo booth. This event is geared toward younger children ages 1-8, and tickets are $5 in advance and $7 at the door. Tickets are required for children ages 12 months and up and adults. Pre-registering is recommended. Click here to register for the event. In the event of inclement weather, Bountiful Babies will take place indoors. Guests are encouraged to bring non-perishable food items to donate for a local food pantry. Natural Valley Ranch is located at 6310 E. County Road 350 North in Brownsburg. I spoke with owner Marie Damler recently and she said her No. 1 tip would be this: wear appropriate clothing to the event. Natural Valley Ranch is a working farm, so it&apos;s important not to wear sandals or open-toed shoes. Damler also said they have already sold more than 200 tickets and the farm might be a little crowded. Be prepared to practice a little patience and be flexible when it comes to participating in the different activities. If the face painting line is long, pet some of the animals instead.